This formulation contains herbs used in the original Harmony Menopause but at a stronger dosage. They are both multi-herb blends that cover multiple symptoms as women going through the hormonal changes of perimenopause and menopause need help to relieve stress, hot flushes and provide nourishment for the whole body to help build reserves of ongoing wellbeing, energy and vitality. 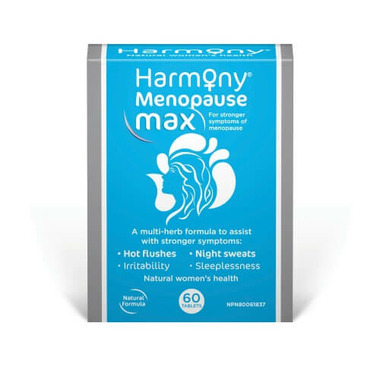 For the relief of mild to moderate symptoms or ongoing maintenance we recommend the original Harmony Menopause, but for those experiencing stronger symptoms we recommend Harmony Menopause Max. Was experiencing hot flashes, nightly sweats and sleeplessness. Worked within a week on flashes and sweating - it was such a relief. Helped a bit of sleeplessness but could be extra stress in my life that keeps me awake - it did even before the menopause. I don't think it did much for irritability - or at least by husband doesn't think so.